When tragedy strikes, seventeen year-old Ashton Blake sets out on a cross-country road trip, leaving the comforts of Malibu for the mountains of Kentucky. Along the way, she encounters Gabe Willoughby—the mysterious drifter with eyes like the sea and a knowing smile. Getting to know Gabe raises questions about her past. But no secret can be buried forever, and Ashton soon finds herself in a world where water is air and myth becomes reality. Hope Collier is a manuscript editor and the author of the Willows series for young adults. She lives in Lexington, Kentucky. Dude, first and foremost I think I was going to pull my hair out from all the lies and deceit! I need to know what Kevin thinks Kyle might have “told” her. I totally saw the Gabe twist coming, even though it hasn’t been mentioned yet, I’m placing my bets that it’s what I think (Ileana’s first love story related). The story is pretty intense at times, never boring. I love it! 5.0 out of 5 starsBreathtakingly Beautiful and Exciting! 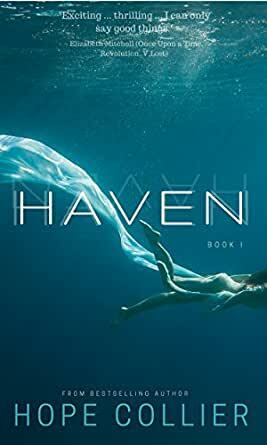 I have enjoyed Haven from the exciting beginning to the suspenseful end! I have already purchased the next volume so that I can learn what will become of Ashton! There is such a beautiful romance woven in with tremendous suspense, betrayal, and a beautifully decorated world that I was able to picture so vividly in my mind. Even though fantasy isn’t my usual choice, this book has opened my mind to the possibilities! Thank you for writing such an amazing story. It’s definitely one of my favorite reads ! 4.0 out of 5 starsBravo!!! Let me just say that this had been a very enthralling book. It's actually my first time to read a story focused on dryads and Naiads; I didn't even know what they were. But I have heard about this mythical creatures in Rick Riordan's Percy Jackson books. At least I had an idea when I read The Willows: Haven. I love how the author Hope Collier created a story about love for family, friendship, loyalty, and acceptance. I was instantly drawn to Ash the moment she left her birthday party and ditched her boyfriend. The main characters, Ashton, Gabe and Kevin, as well as Kyle, were the main reasons why i couldn't put the book down. It's as if I was instantly drawn into their world and I have no intention of getting out because theirs is a magical and captivating. This book is amazing! The author has the most beautiful way of writing that just captures you. It was really hard to put this book down. I really like that Collier does not give you every information right away, she really knows how to keep your interest. When Collier writes I can almost feel what the characters feel, and that to me is really good writing! I love Ashton and Gabe, the characters in this book, and the tension between them is so well written you feel you can almost touch it. Ashton is such a strong young woman, she's been through so much in her young life and still she makes it work. Life does not make it easy for her but she never loses her will to fight for herself. Gabe... Well what to say about him. He seem to be a great guy and well to be honest really dreamy but you can't shake the feeling he has an ulterior motive and Collier is really good to keep you guessing to the last page almost. There is so much happening in this book and then we Kyle the best friend and really you just have to like the guy but like so much in this book: Nothing is what it seem to be! 5.0 out of 5 starsAdventure Awaits! This is a book you will want to read! Amazingly well written. Good strong characters who have depth. Story line is full of adventure, mystery, fun and love. I thoroughly enjoyed going along for the ride and exploring the new world Ashton is thrust into. I fell into this world so easily and it's because it was painted so well for the reader. You don't need pictures or any of that, it's described so well that you can see it. The twists and turns Collier throws at you you won't see coming! This is a book that is great for young adult readers to any ole age. I cannot wait to see what happens next so I am trying to patiently wait for The Willows: Thorn! !